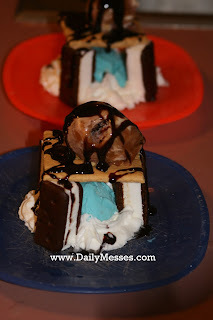 As you might recall from my Big Wheeled Ice Cream Sundaes post, Hubby makes the boys crazy deserts on Thursday nights. This time was no different. He made an ice cream tower sundae. The boys flipped over it. 1. Place a scoop of ice cream in the middle of a plate. 2. Cut strips from an ice cream sandwich and place 4 around the scoop. These will form the towers. 3. Place a graham cracker square on top of the ice cream sandwich sandwiches. 4. Top with another scoop of ice cream. 5. Fill gaps between the ice cream sandwich towers with whipped cream. 6. Drizzle chocolate syrup over the entire tower.